I haven't taken a road trip without Walt Whitman since I left Mount Carroll in January 2012. "I pass death with dying, and birth with the new-washed babe... an am not contained between my hate and boots,"
I wanted to take it with us to Fancy Farm because if there is any place Walt needs to be, it's around a bunch of politicians in their natural habitat of vulturing, hand kissing, and baby-shaking. After all, Uncle Walt was a journalist. Like any poet and any journalist, he was a pre-eminent muckraker... finding the story wherever it's buried. 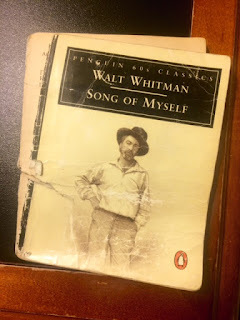 When I dug out my copy of pocket Whitman, it was in pieces. I didn't have time to tape it together, and brought it anyway. After all, Uncle Walt would not have wanted to sit out when there's proper loafing and inviting of the soul to be done among the political princes and hopefuls here in Kentucky. "I discover myself on the verge of my usual mistake." A few light kisses... a few embraces... a reaching around of arms..."
we're all in this together, Dear Friends and Readers.